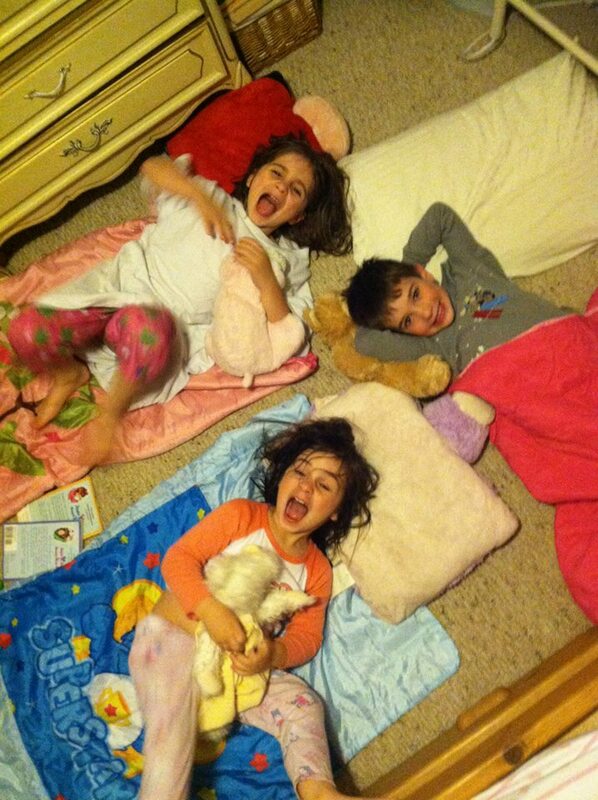 These are the faces of three cousins who weren’t planning to get a lot of sleep. Missing are the two cousins in the other room who also didn’t get a lot of sleep. Aunt Beth got them settled, and then I sang some lullabies and then Aunt Beth and I went out and left Uncle Scott to administer the second and third warnings. Everyone was asleep when we got home, so it seemed like a success. Jack has no memory of the time Aunt Beth got up to go to the bathroom and found him whimpering and offered to take him downstairs to find me, or the time Uncle Scott ran into him either. But around 5:00 am, I ran into Jack and Hope, and she was helping him find me as I was heading to the bathroom. Jack was upset, the cat was scratching to be let in, and I really had to go to the bathroom. Jack said, “I had a TERRIBLE NIGHT. There was a FAN, right by my HEAD. ALL NIGHT. A FAN in my FACE!! !” (Note that there is no fan in that picture.) I said, “Shhhh. Shhhh. Shhh. Go lay down on the couch, I’ll be right back.” And I headed for the bathroom. The door was shut and the light was on. Hmm. I really didn’t want to go upstairs to the bathroom because it was all the way upstairs, and I feared I would run into a lot of kids that were awake, and it was too early for that. So, Jack was awake, the cat was scratching and really had to go to the bathroom. I turned to Jack. He said, “Blah blah FAN in my FACE blah blah etc.” I checked the bathroom, someone was still in there. So I let the cat in. One thing dealt with. Fan in my face, someone still in the bathroom, upstairs still too far away. I started to knock, because some truly strange sounds were coming from the bathroom when there was sort of a crash and the door opened and Anthony rolled out. He had a tiny table full of legos in there and he was busy building something. I said, “Uh. Anthony? Can I use the bathroom or would you prefer that I go upstairs?” He said, “Go upstairs please.” OK. Upstairs I went. And then I was on the couch, getting under a blanket and snuggling in with Jack for a couple more hours of sleep. Really snuggling in, under a big thick blanket, right next to Jack, on a hot summer night. But we did survive the next day, even if we were sleep deprived. I wish we could do it again this weekend. This entry was posted in Uncategorized on June 18, 2013 by metamegan. a bittersweet beginning to what I hope is a summer of blogging. I can’t wait to read you.